Welcome to Col André Kritzinger's Railroad Picture Archives! Welcome to the RRPictureArchives.NET contributor site of Col André Kritzinger. My aim is to display at least one picture of every loco and of each side of every wagon type used by South Africa's railways (National carrier South African Railways-Spoornet-Transnet Freight Rail, mainline passenger carrier Shosholoza Meyl and commuter carrier MetroRail), with more pictures to display the different paint schemes used on each type. I'll also include some (hopefully useful) information on each item if I have it, like the date in service, number range, dimensional data, power details, etc. Much thanks here to Johann Ras and to Sue Lawrence in Australia for providing me with piles of official SAR diagrams, and especially to Fanie Koekemoer at Koedoespoort for allowing me access to his Class 6E1-Class 18E rebuild records. 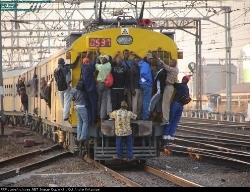 South Africa only has one nationwide railway system, so official reporting marks were never necessary. The exception is two foot gauge narrow gauge equipment where steam locomotives and wagons were annotated "NG". The South African Railways was renamed "Spoornet" in 1991, and then "Transnet Freight Rail" in 2008, but for practical reasons I used "SAS" as a fictional "reporting mark" regardless of whether an item is marked "SAS/SAR" or "Spoornet" or "MetroRail" or "TFR" on its paint scheme. I tried some other options - "Spoornet" showed up as "SPOO" on the site, SP belongs to the Southern Pacific, "Metro" is used by several rail systems around the world, "SAR" is also used by the Savage Alberta Railroad as well as by the Saudi Railway Company, but in railway terms "SAS" is probably recognisable worldwide as belonging to South Africa. At the time I started with these pages TFR hadn't arrived on the scene yet. When better pictures of an item become available, I plan to replace previous pictures with it rather than just adding the new ones, in order to stick to my self-imposed rule of only one picture per type, side and colour scheme. Exceptions to the rule will be container flats, to show different container loading configurations. Pictures of date-specific events like train wrecks and derailments will be put into separate albums. I will also include pictures of the occasional visitors to South Africa that I encounter from Namibia (NAM -TransNamib), Mozambique (CFM - Caminho de Ferro de Mocambique), Angola (CFB - Caminho de Ferro de Benguela), Botswana (BOTS - Botswana Railway), Swaziland (SWAZ - Swaziland Railway), Zambia (RSZ - Railway Systems of Zambia) and Zimbabwe (NRZ - National Railways of Zimbabwe). The pictures are arranged in the albums listed below. You can click directly on the underlined headings below to get to them. Your feedback will be appreciated, especially if you spot errors, which hopefully will be few.